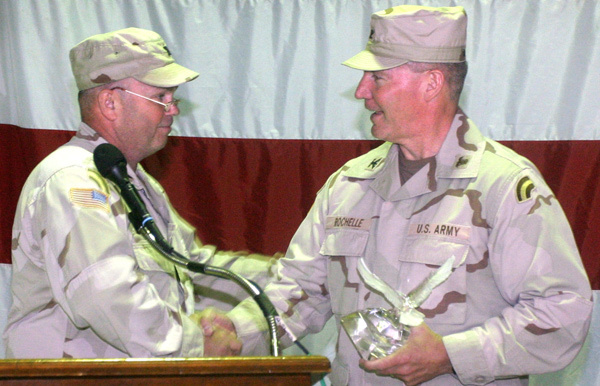 Incoming commander Col. John M. Nunn shakes hands with outgoing commander Col. William E. Rochelle. Photo by Sgt. 1st Class Robert Stephenson, NJDMAVA/PA. For the Army Guard Soldiers that call the Somerset armory home, June 3 was a day filled with hails, farewells and well-deserved honors. 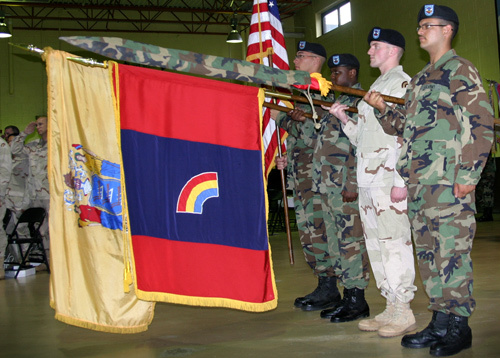 The 42nd Division Support Command (DISCOM) cased its colors while later in the day, the unit's Soldiers were recognized at a Freedom Salute for their 19-month Operation Iraqi Freedom mobilization. As part of the Army's ongoing transformation, DISCOM, has been redesignated the 42nd Regional Support Group (RSG). The 42nd RSG's mission will remain much the same as the 42nd DISCOM's, although fewer units and Soldiers will fall under its command. The 119th Corps Support Battalion (CSB) and the 50th Finance Battalion make up the major portion of the 42nd RSG. New water purification and chemical companies being formed will join the 253rd Transportation Company as part of the 119th CSB. The 50th Finance Battalion oversees all the finance, adjutant general and public affairs detachments along with the 63rd Army Band. With the unfurling of the new RSG colors, Col. John M. Nunn took command from Col. William E. Rochelle. Nunn joined the Army in November 1969 and eight years later moved to the National Guard. His first stint with the 42nd DISCOM was in the early 1990s. He returned to the unit as executive officer in December 2000. DISCOM can trace its lineage back to Feb. 22, 1917, when it was organized in the New Jersey National Guard as the 1st Infantry Supply Company. Following service in Europe during World War I and World War II, the 42nd spent nearly half a century with the 50th Armored Division. It was reorganized as Headquarters and Headquarters Company, 42nd Infantry DISCOM, in September 1993. The unit distinguished itself as part of the 42nd Infantry Division, the first National Guard division to command 18,000 Army, Guard and Reserve troops as part of Task Force Liberty in Iraq while stationed in Tikrit in support of Operation Iraqi Freedom III. The 42nd DISCOM colors on display for the last time. Photo by Capt. Jon Powers, 444MPAD.